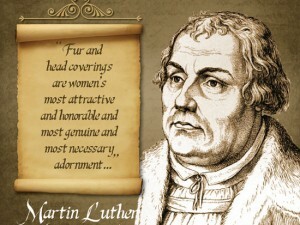 What Did Martin Luther Believe About Head Covering? Martin Luther (1483-1546) was a German theologian who was the catalyst behind the Protestant Reformation. He is author of many books, lectures, commentaries and hymns (including “A Mighty Fortress is Our God”). Luther also translated the Bible into German. Today there are more than 73 million Christians who identify with his theology, known as Lutherans. Women, be subject to your husbands as to the Lord, for the husband is the head of the wife” [Eph 5:22-23]. Again to the Colossians in the third chapter [3:18]. Because of this, the wife has not been created out of the head, so that she shall not rule over her husband, but be subject and obedient to him. Luther makes a direct connection between veiling and the creation order. He points out that woman was not created out of the man’s physical head, but from his side. Luther sees the place she was created from as important due to the symbolism. She wasn’t created from man’s head, as if she’s head over him, but rather she wears a headdress to show she’s under her husband and obeys him. From that quotation we see that Luther did not see covering as optional. He said a wife should wear a veil in the same way that she is “duty-bound” to help her husband. Switching away from the literary evidence, we can also confirm Martin Luther’s belief in head covering by examining ancient art. At the National Museum in Copenhagen, Denmark there is a painting dating back to 1561 of Luther preaching. In this painting we see that not only are the women covered but the men remain bare-headed as well. So for Martin Luther’s church head covering was the standard practice. Paintings of his wife, Katharina Von Bora, also show her wearing a covering. 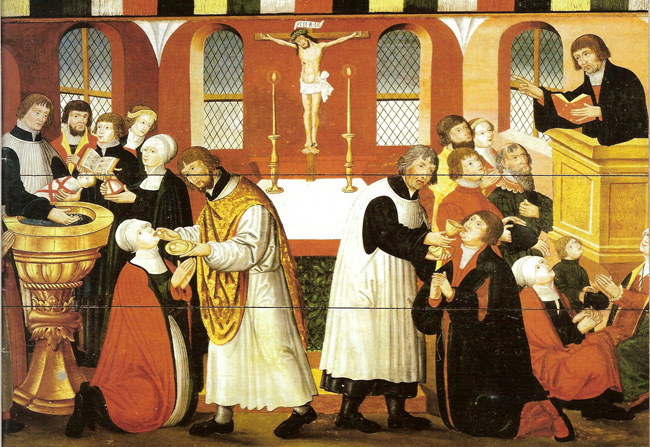 This shows that not only was it the practice of those in his church, but it was practiced in his home as well. At what times does he believe women need to be covered? Unknown for sure, but paintings of his wife suggest he didn't see it as limited to church. What did he see the covering as? A symbol relating to a wife's submission to her husband. 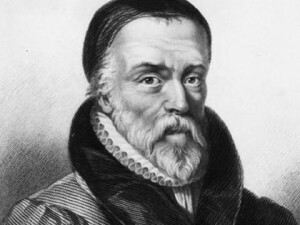 What Did William Tyndale Believe About Head Covering? That’s rather enlightening. Especially the bits about the art work – I had seen those paintings before, but never really thought about the head-covering aspect. Does anyone know if he thought the command only applied to wives, not women in general (including young girls or single women)? It seems only references wives in his sermon. Thanks for the comment Jade. There wasn’t enough info that we’d be able to decipher he’s view on that matter. The context of his message was a sermon on “marriage” and he was commenting on specific verses that dealt with marriage so it makes sense why he’d comment on wives specifically. He may have thought it applied to all women, or just wives. I did a pretty thorough search and couldn’t find any other relevant references. Do you have a link to that sermon? As far as I can tell, it’s only available in German. I believe it’s scheduled to be translated into English by a publisher but I don’t think it’s available in it’s entirety yet. And your point is? That in the middle ages headcoverings and veils were the custom? 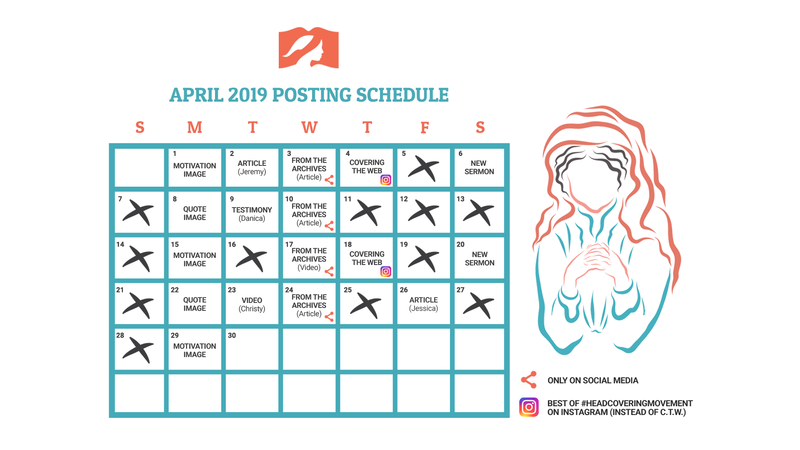 The point is to show the consistent witness of the church that women should be covered, a practice based in Scripture that only fairly recently has stopped. It’s, btw, 1 Corinthians 11 (not 2, as the translation suggests). There’s furthermore stated, in 11:14, that it is degrading for a man to wear long hair. If you look at the mop-tops of the men in the painting (and at paintings of the savior through the ages) it seems that Bible reading was (and obviously still is) always eclectic, serving the moral and immoral needs of those quoting it. For what it’s worth… Martin Luther, along with the other major reformers viewed head coverings as a culturally variable custom. Germany was an area where women, by natural custom, wore hoods in their everyday lives, for the sake of propriety. These women also continued to wear these hoods in their worship services as was the common custom. It should also be noted that John Calvin, the Genevan reformer signed a version of this confession, called the Confessio Augustana Variata, in 1540. As I previously stated, the Reformers, and the Reformed and Puritans after them, have viewed this issue as an outworking of culture, not biblical mandate. Thanks for showing me this sermon clip from Luther. I was not aware of it. 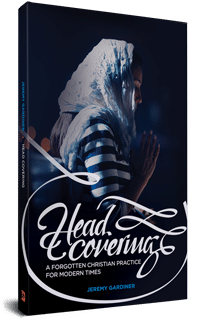 In the first quotation of this article, he exhorted women to cover their heads with a veil based upon the creation order and by pointing to 1 Corinthians 11. Since that’s an undeniable quote in support of the ongoing practice of head covering, it must be taken into account and harmonized with the one you provided. In the quote you provided, it could be argued that he’s referring to the cultural customs of covering among Jewish people, as opposed to the Scriptural command that was given to the primarily gentile church in 1 Corinthians 11. He doesn’t reference the Scripture at all and he’s speaking of customs so that’s a legit harmonization in my view. Not every mention of covering should be understood as the Scriptural imperative given by Paul. After all, Jews don’t base their covering/uncovering customs in Scripture, but tradition. We do know that Jewish women covered in Paul’s day. We have no idea what the Jewish custom was (males covering their heads was much later). The other interpretation is that Luther changed his mind (which we’ve all done on various issues). He could have gone from a covering view to non-covering or a non-covering view to covering. We’d have to examine the date of this quote if that were the case (which I can’t find after a very brief search). However, I’d only feel compelled to take this view if your quote had specifically mentioned Scriptural covering. The first harmonization is satisfactory for me. May I ask how you’d harmonize the first quotation I referenced with the sermon clip you provided? Hi Colin, I think discussing the Augsburg confession clouds the issue rather than bringing clarity to Luther’s own view. He never wrote it and I’m not claiming that Lutherans, or his contemporaries took his viewpoint on HC (I’ve never looked into it). I’m no expert on this confession but Wikipedia mentions that Luther didn’t contribute to the document. It reads: “The Augsburg Confession became the primary confessional document for the Lutheran movement, even without the contribution of Martin Luther”. Adhering to a confession (assuming he did) does not mean that you would say everything the same or agree with every point. That’s why I don’t think it’s helpful in adding clarity to Luther’s own view. One takeaway I’ve noticed from your rebuttal is I now see how you can see your own interpretation of 1 Cor 11 as cultural in someone elses argument. For example, if Pastor X says, “women should come to church with head coverings because it’s commanded in 1 Corinthians 11”, you could still see that statement as consistent with the cultural view. You could conclude that in that Pastor X’s culture head coverings were customary, so he encouraged women to not break that custom because after all, that’s what Paul did (encourage women to not break this social custom). You’d need to see an explicit statement that’s it’s cross-cultural and timeless to count it as an endorsement of the non-cultural view. I don’t see it in this way, though I do understand where you’re coming from. If your interested in further reading on the subject Eugene F. Klug wrote an article entitled, “Luther’s Contribution to the Augsburg Confession” in the July 1980 Volume of the Concordia Theological Quarterly. In it he details the role that Luther played in the formation of the Confession, including a constant stream of letter to Melanchthon, demanding continuous updates on the details of its composition. It’s very true that Luther never penned a word of the confession, but it is quite contrary to the evidence to assume that it was not representative of his theology. Just to clarify, Cawdrey and Cotton are debating church government, and whether or not Synods have the right to order circumstances of worship. Cotton has basically pursued a line of argumentation that synods cannot make such rules about matters indifferent. Cawdrey responds by asserting that head coverings were a matter indifferent, and that the only way for Cottons argument to hold any water is if Cotton asserted that head coverings were a necessary moral duty. Cawdrey dismisses this line of reasoning, knowing that Cotton would never assert such a thing, because no interpreters of that passage regard it as a necessary moral duty. And mind you, Cawdrey wrote this work after the completion of the Westminster Directory for Public Worship was completed, meaning he sat in a room with 120 other Puritans for months on end, debating all manner of aspects of Public Worship. We know from Robert Ballie’s journal’s that the subject of head coverings was discussed in those meetings, but Cawdrey can still confidently assert that he is not aware of a single person who interprets 1 Cor. 11 as a necessary and moral commandment. This kind of quote sticks out to me because it specifically addresses the matter at hand. Not whether Paul commanded the Corinthian women to cover, we all agree on that, but whether or not Paul intended it to be perpetual and moral. I know my view might be a little confusing at first, I feel like I have to spend a lot of time distancing myself from a lot of other people who adopt a “Cultural View,” but I really am convinced that it is the common view of the Reformed Churches. If there’s anything I need to do to help clarify what I’m saying, let me know. I’m not always the best at explaining where I’m coming from. I do have a question regarding your understanding of the subject. 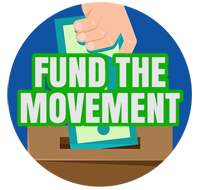 If the “cultural propriety” changes are due to something like the feminist movement in the last 150 years here in America, would you still consider it proper to cover in the assembly? In my understanding, the practice was originally set aside in order to rebel against the symbolism of male authority. It offends many in today’s assemblies for the same reason (though I believe many don’t realize it even themselves). Any “Christian” practice can lead to religious pride, but that is not good reason (in my opinion) to avoid teaching the subject as pertaining to any believer. I too have an aversion to embracing any doctrine based on historical compliance, but also have trouble setting aside a teaching, because of cultural aversion to it. It was “proper” for women to cover in the assembly until fairly recently. As offensive as the “test of fellowship” rule for any doctrine, is the idea that we can set some teachings aside in light of current (or historical, for that matter) cultural practice. Kay, I’ll try to respond tomorrow, but it might not be until the evening. I’m glad you are enjoying the discussion. I’m enjoying having it! Kay, sorry it took so long to get back with you! Been a busy couple of days. First off all, one thing I would just like to clarify is that I came to the conviction that 1 Cor. 11 was to be interpreted culturally independent of my study of study of historical positions. Paul’s lack of use of moral language, his constant appeal to societal (not moral) standards (dishonor, shame and comeliness), and Paul’s specific citing of head coverings being a custom in verse 16 all convinced me internally from the text that Paul was commanding the use of a cultural custom in the same way that Christ commissioned the use of foot washing. After coming to this conclusion, I have been encouraged to see that this position has been the historic understanding of the passage by the majority of Protestantism, and have used their comments to refine and clarify my thoughts, but I would never endorse or recommend that someone adopt the position simply because of the weight of historical testimony. I can provide you with a large number of quotes from well-respected Protestant theologians that show that this position has rarely ever been held to be binding on all women in all ages. I believe that we should seriously consider their opinions and arguments, as these men have all been led by the same Spirit who leads and guides His sheep today, but we should never embrace or endorse a position for any other reason than the Holy Spirit speaking in the Word of God. It alone is the rule of faith and life for all who believe, never a man’s opinion, a church or a creed. The only reason why I quote these men is to help to shed some light on the common argument from head coverings advocates that the pro head covering position was the accepted position of the Christian church for the last 1900 years, until feminism began to erode ecclesiastical usage of the practice in the 1960’s. I can provide you ample evidence that Protestantism has rarely ever endorsed this position (although I am more than willing to admit that there have been men who regarded it as a perpetual and moral duty. John Murray is a great example. Jeremy, if you happen to read this, there’s a really good chance you are already aware of this, but you might look into the thoughts of the southern theologian Robert L. Dabney. I can’t remember exactly where I ran across it, maybe in his “Discussions” but he definitely advocated for a perpetual and moral interpretation of the passage.) I think I can also give evidence that it was not the historical position of the Roman Catholic Church. William Whitaker, an English theologian whose intellect and learning were legendary in his own day, and who was highly respected even by the leading Roman Catholic apologist, Robert Bellarmine, wrote in his famous work “Disputations on Holy Scripture” that, “For the apostle speaks of that modesty which women ought to observe in congregation, and of the decency also which is required in men when they frequent religious meetings and assemblies. He requires men to pray with uncovered, women with covered heads: which injunctions are not of a perpetual obligation; for they are not now observed even by the papists themselves; so as to make it plain that all churches are not bound to the same ceremonies.” Whitaker seems to have been under the impression that even Rome, who was famous for intruding man made ceremonies into Divine worship, didn’t continue the practice of head coverings. This is also evidenced by the fact that Priests, Bishops, Cardinals and Popes in the past and up to this day attend worship wearing caps, miters and crowns. attire? A nice dress, a hay, a pair of gloves and jewelry. Ask women who lived during this time why they wore hats to church, I have, and they have consistently given me the same response, “We always used to wear hats when we got dressed up.” No mention of 1 Cor. 11, or a symbol of power, just formal attire. In my opinion the social revolutions of the 1960’s not only brought with them a radical feminism, but they also brought about a radical de-formalization of our culture. We used to get dressed up to do everything, now we don’t get dressed up to do anything. So as people started dressing up less and less for public engagements, we stopped using the accessories that went with formal attire. Women stopped wearing hats because they stopped dressing up so much. Think of it this way, women always used to wear a pair of gloves when they went out and about, or to any social gathering including church, and no one nowadays is blaming the feminists for the disuse of gloves among American women, are they? Of course not. Because gloves were not used as symbols of submission, they were just formal attire. So at the end of the day women in our country should not be expected to wear head coverings out of some kind of cultural deference to days gone by, because women in days gone by were never wearing head coverings, they were just wearing hats. Mind you I’m totally willing to hear arguments to the contrary, everything I just gave you is my best attempt to make sense of the evidence that we have available to us. It is just my opinion. My only issue is that many head coverings advocates use this line of reasoning without ever proving what really needs to be proven, that American women stopped head coverings, not hats. The difference between the two is the entire argument. Thanks for putting it that way! It’s along the lines of my conclusion, I just had no idea how to put it into words. I asked the oldest woman I knew of if she remembered anything about wearing hats to church and she said that it was just the fashion of the time. There wasn’t any symbolism of headship, authority, marriage, or creation order. You’re welcome! I’m glad that it was helpful! I’m not a historian or sociologist, so take my opinions with a grain of salt, but this explanation seems to make the most sense to me given the information that we have. Again, I’m always open to correction! I just know that historically speaking, women were seen as secondary – some of the past religious thinkers had these things to say: “The word and works of God is quite clear, that women were made either to be wives or prostitutes.” or “No gown worse becomes a woman than the desire to be wise.” or ” to the end (women) should remain at home, sit still, keep house, and bear and bring up children.” These quotes were all written or spoken by Martin Luther. They are biased in the thinking of his time that women are limited (weaker, inferior) in every way. That bias cannot help but be present in the way and the things they teach and their interpretation of doctrines. Martin Luther is a product of his time as I am mine, and in a world where there is more and more equality … I have to chose carefully which message to send, that Christianity’s history sees women as lesser and incomplete without being a wife, or that God cares more that their heart is in the right place than whether or not a ring is on their finger. If anything, appealing to Christian history shows how wrong our predecessors have been in the past and how capable people are of being wrong in the present and in the future. You are absolutely right, there was an imbalance that existed in the church. I am complimentarian, but also aware that issues like gender and race had some serious blind spots, with some horrible repurcissions, in ages gone by. Just wanted to shoot out a quote to show that not all of our forefathers approached the issue as Luther did. For purely historical reasons you might also check out “The Womans Glorie” by another Puritan, Samuel Torshell. It contains many similar such sentiments and is a kind of rebuke to cultures that had a low view of women. Thanks! I’m glad that there’s an exception to that prevailing sentiment, I’ll look out for the book. Now that I think on it, none of the churches I’ve ever been to have taught on puritans or any form of church history for that matter (because it’s not IN the Bible) – I’ve had to look up what I can online to get a more complete picture of where the church is compared to where it was. Thanks, for the info on the Augsburg confession. If he said that, then yes, you’re right that it is relevant to the discussion. I must end my discussion on Luther here as time does not permit me to do further research and to harmonize the different statements. I do plan to come back to it, but not sure when that will be. Our discussion will be left here though for people to sift through. I know what you mean about head covering advocates misquoting theologians in support of their view. I’m aware and agree with you that many puritan era commentaries take the cultural view (Geneva Bible, John Wesley, Matthew Henry, Matthew Poole, Richard Baxter etc.). At HCM we’re committed to integrity in quotation and writing. If we’ve misquoted or interpreted someone or something wrong we’ll change it. If after I’m done re-studying Luther, it turns out that you’re right then I’ll change the article. Thanks for stopping by and keeping me on my toes Colin. Luther said that quote above on May 15 (not sure of the year – see below for the source). That was not a statement about the completed confession, but a draft. After Luther said that “the Augsburg Confession was diligently improved, polished, perfected, and partly recast. Additions were inserted and several articles added.” So we really don’t know if that statement about head covering was present or worded differently at that time, since it was a draft. To prove further that Luther’s statement about the perfection should not be applied to the final version, Luther wrote back on June 26th (a month later) after hearing a revised version. He “praised it, yet not without adding a grain of gentle criticism.” So after he had said he knows “nothing to improve”, he had criticisms of it. That shows that the document had been changed or Luther’s first statement was hyperbole. 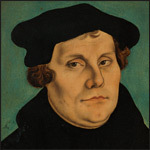 It is obvious that Luther has happy with the confession and a supporter of it, but that does not mean he would word everything the same way that Melanchthon did. Or that there wasn’t minor disagreements. I think the Augsburg confession can only be used as evidence for the beliefs of the people who wrote it, not those who signed it. It is not uncommon to uphold a confession but disagree in some minors. For example, I know of one prominent Presbyterian minister who upholds the Westminster Confession but when questioned by his presbytery he listed a few things in the confession that he would understands/would say differently. That’s just standard with confessions/declarations. You’re affirming the majority or in some cases, the big ideas of the document. It’s general support, not agreeing word-for-word on everything. Excuse me. I looked up pg 58 of Cottons book you cited and he does not reference head covering in a list of cultural things along with the “holy kiss”. Cotton says that head covering was attested to by “the light of nature and the custom of the churches”. Can you clear this up? Thanks for the reply! First of all, I’m not so sure the Luther quote can be so easily dismissed. In the context of the sermon Luther Is talking about justification, and is arguing that justification makes us equals in the sight of God. In justification there are no differences between Jews and Greeks, males and females. He is also arguing (as he almost always is) against a works righteousness mentality that can creep into Christian thinking, hence he has to specify that these customs do not render one righteous in the sight of God. Luther here is bringing up examples of things that Christians might be tempted to make moral issues of and consider acts of piety. If the head covering mentioned in this passage is entirely unrelated to Paul’s command, then Luther’s point becomes kind of silly. Luther’s point only makes sense if the customary differences between the sexes are considered by some to be acts of piety, as circumcision clearly was by the Judaizers. Second, you didn’t address the Augsburg confession, which has been the official doctrinal confession of the Lutheran faith since the time of Luther, and was subscribed to by Luther himself. It specifically states that head coverings are not to be regarded as necessary services, and that one should not consider it a sin to not use one, as long as no offense is given to others in the process. As for my reconciliation of the above passage, I don’t see any contradiction between the quotes. 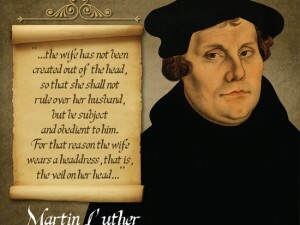 Luther nowhere in the quote states that head coverings are a perpetual moral command for every woman in every culture. He simply notes that Paul commands women to wear head coverings in 1 Cor. 11. I adhere to the interpretation that Paul was commanding Corinthian women to wear the customary head covering common to married women in their society. As such I believe that Paul’s command would transfer to any society in which is is ordinarily proper for women to wear a head covering. 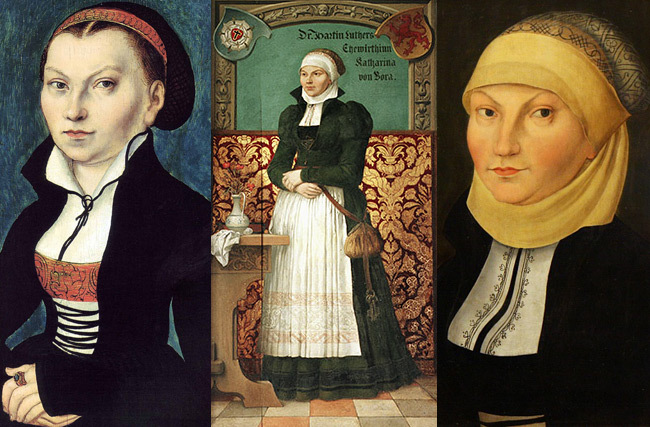 If (as all the evidence points to) 16th century Germany was a land and culture in which women, in their everyday lives, were expected to wear a covering for modesty’s sake, then they should be expected to wear one in church services as well. As such Luther could both appeal to Paul’s command to wear the covering, because of German custom, and also believe that the head covering was not a perpetual moral duty of Christian women. Just to be clear, I believe that Paul was commanding the Corinthian women to wear head coverings. I believe that Paul appeals to the creation order, the diverse roles of men and women, the light of nature and the presence of angels to support his assertion. Reformed commentaries of the 16th and 17th century all assert the same thing. They also assert that the covering was a cultural or customary sign only for use in those times and places. These is no contradiction between these two positions.